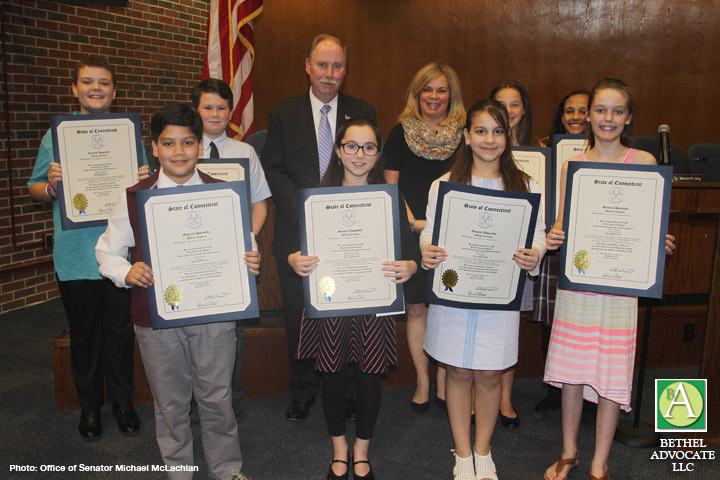 Photo: Front Row (Winners) Camil Toscano, St. Peters School; Ella Burns-DeMelo, Bethel Middle School; Talia Pereira, St. Joseph School; Kayla O’Marra, St. Mary School Second Row (Runner up’s) Shamus O’Grady, Bethel Middle School; Aaron Griffin, St. Mary’s School; Sen. McLachlan; Michele Bonvicini, Union Savings Bank Director of Community Relations; Carina Clark, St. Joseph School. Two Bethel Middle School students, Ella Burns-DeMelo (winner) and Shamus O’Grady (runner-up) are among the students chosen to be celebrated in the Union Savings Bank 8th Annual National Women’s History Mont Essay Contest. Congratulations to all the students honored! 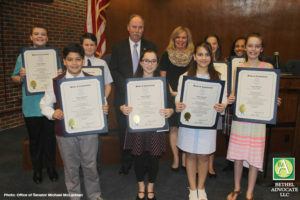 In a ceremony at Danbury City Hall, State Senator Michael McLachlan (R-24) and Union Savings Bank celebrated the winners of the 8th Annual National Women’s History Month Essay Contest. Students were asked to focus on one notable Connecticut woman, detailing her life and accomplishments, and then describe what those contributions mean to them. Sen. McLachlan said the contest accomplishes multiple educational objectives, from learning how to research to learning more about the state’s history and the important role women have played. The contest also helps children learn to effectively communicate their finding in a written format. Sen. McLachlan thanked Union Savings Bank for donating the prizes for the contest. “This event would not be possible without their incredible generosity,” he said. Sen. McLachlan represents the communities of Bethel, Danbury, New Fairfield, and Sherman. Photo: Front Row (Winners) Camil Toscano, St. Peters School; Ella Burns-DeMelo, Bethel Middle School; Talia Pereira, St. Joseph School; Kayla O’Marra, St. Mary School. Second Row (Runner up’s) Shamus O’Grady, Bethel Middle School; Aaron Griffin, St. Mary’s School; Sen. McLachlan; Michele Bonvicini, Union Savings Bank Director of Community Relations; Carina Clark, St. Joseph School.